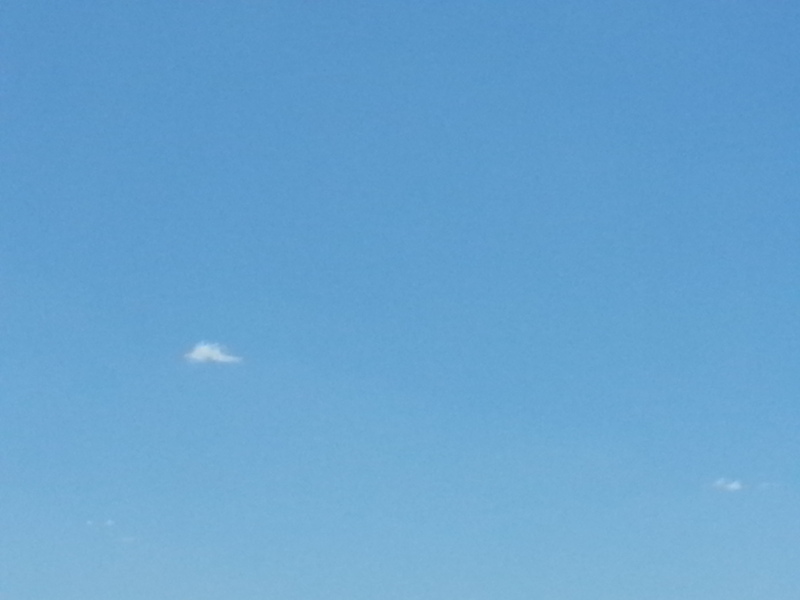 On this absolutely gorgeous day…that I’m thoroughly enjoying….I see this little teeny cloud. And I started thinking about Elijah praying to end the drought. I am not praying for rain but I am praying that you get a hold of the same kind of resolve that Elijah had telling his servant and Ahab to run from that teeny cloud, knowing with all that he was that God had answered His prayer. Faith is believing before you see the manifestation of your promise or answer to your prayer. Knowing that He who has promised is faithful. Seeing isn’t believing, believing is seeing! I am the only one who determines how I receive from God and perceive the world around me! Only I have the power to decide whether I embrace the awe and wonder of life or whine and complain about it. I am all powerful in how I choose to react. I know the faith walk ain’t for sissies. Believing God when all the evidence points against it is difficult, especially when you’ve been hurt and disappointed. But that’s exactly the time to look for awe and wonder in your life. That’s when you need to choose to expect good! Why do you think Jesus called those little bitty kiddos the greatest in Matthew 18? Think about it? Little kids just believe, and they walk around amazed by everything they see. Everything is new and exciting. That’s exactly what childlike faith looks like. That is what pleases and impresses Jesus. What if today you expected awe and wonder? What if you went around knowing that our Father has good surprises for you everyday, hidden amongst the ordinary and mundane? What if you truly believed God is for you and not against you? What if today you just believe that God loves you? What if you just received His love like a toddler being picked up and cradled by their daddy? I will leave you with this…the Greek word “know” in Romans 8:28 actually means to see therefore to know. It is connected to the word optomai (op’-tom-ahee), which means to gaze at something with wide open eyes, as at something remarkable. It means to be amazed by what you’re seeing. This isn’t a factoid to put in your knowledge bank, it is something you witness and are blown away by. If God asks you to give something up, there’s a purpose in it, and you’ll always have a choice. Even Jesus had a choice.